For fans of Brain on Fire and My Stroke of Insight, an incredible first-person account of one woman’s journey to regaining her language and identity after a brain aneurysm affects her ability to communicate. Lauren Marks was twenty-seven, touring a show in Scotland with her friends, when an aneurysm ruptured in her brain and left her fighting for her life. She woke up in a hospital soon after with serious deficiencies to her reading, speaking, and writing abilities, and an unfamiliar diagnosis: aphasia. This would be shocking news for anyone, but Lauren was a voracious reader, an actress, director, and dramaturg, and at the time of the event, pursuing her PhD. At any other period of her life, this diagnosis would have been a devastating blow. But she woke up...different. The way she perceived her environment and herself had profoundly changed, her entire identity seemed crafted around a language she could no longer access. She returned to her childhood home to recover, grappling with a muted inner monologue and fractured sense of self. Soon after, Lauren began a journal, to chronicle her year following the rupture. 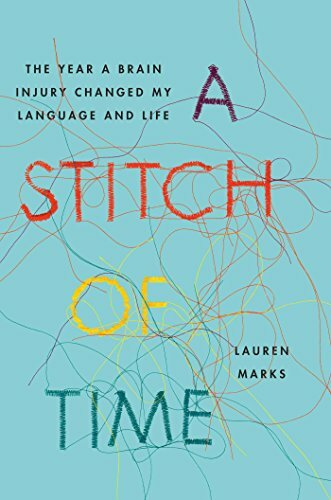 A Stitch of Time is the remarkable result, an Oliver Sacks–like case study of a brain slowly piecing itself back together, featuring clinical research about aphasia and linguistics, interwoven with Lauren’s personal narrative and actual journal entries that marked her progress. Alternating between fascination and frustration, she relearns and re-experiences many of the things we take for granted—reading a book, understanding idioms, even sharing a “first kiss”—and begins to reconcile “The Girl I Used to Be” with “The Girl I Am Now.” Deeply personal and powerful, A Stitch of Time is an unforgettable journey of self-discovery, resilience, and hope.